Researches from Thailand have shown in their study that human embryos cryopreserved and stored for 18 years can yield viable embryonic stem cells after thawing and these cells could prove a valuable resource for drug screening and research. Click to read more..
1. Did you know that the partially synthetic bacterial cell created at the J Craig Venter's Institute, had watermark sequences which were coded messages in the form of DNA base pairs to distinguish the synthetic organism from natural organism? In the minimal genome project from the same laboratory, the names of the researchers were included as watermarks. 2. Do you know how animals adapt to sub-zero temperatures? It is because these animals use various biochemical processes including anti-freeze compounds to adapt and live in these environments. The interesting fact is researchers have now identified one of the most active anti-freeze compounds isolated till date called Xylomannan in an Alaskan beetle and more interesting is that this compound is based on glycan in contrast to other anti-freeze compounds which are usually protein based. 2. SPINE 2012 , 13 - 16th September, 2012, Le Royal Meridian, Chennai For details Click here. 4. 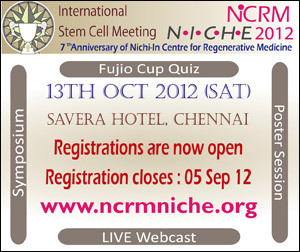 NCRM NICHE 2012, 13 Oct, 2012, Savera Hotels, Chennai For details Click here. 5. 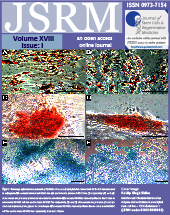 Nov 29-30, 2012; 7th Annual ConGress of the German Ssociety for Stem Cell Research, Leipzig, Germany. For details Click here. "It's far more important to know what person the disease has than what disease the person has."